Henryk Ross, Stephania Ross, Zenon Goldreich and his wife, and Bronka and Jakob Urbach. Henryk Ross (1910-1991) was a Jewish photographer employed by the Statistics Department of the Judenrat (Jewish Council) in the Lodz Ghetto. His job enabled him to document Jewish life in the ghetto, which he did, with thousands of prints and negatives. 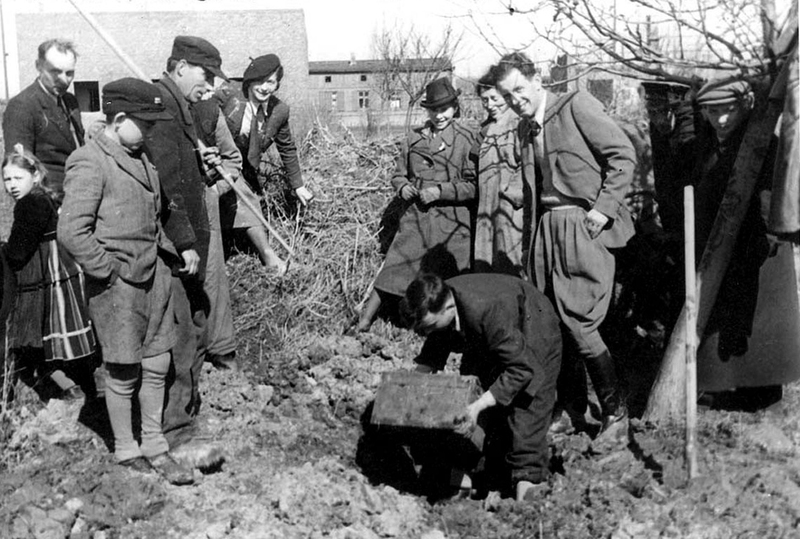 During the liquidation of the Lodz Ghetto in August 1944, Ross and his wife Stephania buried a box of negatives in the field next to his house on 12 Jagielonska Street in the ghetto. The negatives were shot by Ross during the years 1940-1944. Ross survived the Holocaust and returned to Lodz, where he located and dug up the documentary material he had buried underground before the liquidation of the ghetto.